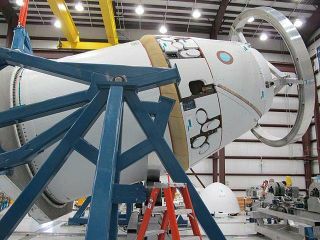 SpaceX's first privately built Dragon space capsule is shown mounted to a fixture in a hangar at Cape Canaveral, Fla., during launch preparations for its maiden test flight. A private unmanned space capsule designed to ferry cargo tothe International Space Station is all set for a key demonstration flight tomorrow(Dec. 7). The Dragonspace capsule built by the California company Space ExplorationsTechnologies (SpaceX) is poised to launch from a seaside pad at the CapeCanaveral Air Force Station in Florida during a nearly 3 1/2-hour launch windowthat opens tomorrow at about 9 a.m. The launch will test the spacecraft SpaceX plans to use tofulfill a $1.6 billion contract with NASA for 12 resupply flights after theagency's space shuttle fleet retires next year.? SpaceX is one of two companies with contracts for commercialcargo deliveries to the station. The other company is Virginia-based OrbitalSciences, which plans to deliver supplies to the station using its new Taurus 2rocket and unmanned Cygnus space vehicles. The first test flights for thosespacecraft are slated for next year. Dragon will launch into orbit atop SpaceX's two-stage Falcon9 rocket. For this maiden flight, the Dragon capsule is expected tomake as many as four orbits around Earth, showing the ability to transmittelemetry data, receive commands and maneuver, SpaceX officials have said. The Dragoncapsule should then re-enter the atmosphere and make a water landing in the PacificOcean, after which SpaceX personnel will recover it by ship. The entire operation should take about four or five hours, accordingto SpaceX CEO Elon Musk. The Dec. 7 flight will be Dragon's first demonstration underNASA's Commercial Orbital Transportation Services program, or COTS, which aimsto advance the capabilities of U.S.commercial spaceflight. "As we move forward with our first demo flight underthe COTS program, we look forward to helping jumpstart America?s space programand secure our leadership position in space," Musk wrote in an Octobermission status update. The gumdrop-shaped Dragon capsule stands 9.5 feet (2.9meters) tall and is about 11.8 feet (3.6 m) wide at its base. It weighs 9,260pounds (4,200 kilograms). The spacecraft is composed of three parts: A protective nosecone, a pressurized capsule for crew and/or cargo and an unpressurized trunk,which houses solar arrays and thermal radiators. The trunk can also hold cargothat doesn't need a pressurized environment. Dragon can haul 13,228 pounds (6,000 kg) of payload up toEarth orbit and bring 6,614 pounds (3,000 kg) back down, according to SpaceX.? While the spacecraft will initially be used chiefly as anunmanned cargo vessel, SpaceX is developing a crewed version, which the companysays could carry up to seven people on round trips to low-Earth orbit. On its supply runs, Dragon will launch atop SpaceX's Falcon9, a 180-foot-tall (55-m-tall) rocket that passed a big test of its own thissummer. In June, a Falcon 9 carrying a Dragon mock-up madeits maiden flight, reaching an orbit about 155 miles (250 kilometers) aboveEarth. "The upcoming demonstration mission will launch fromCape Canaveral and should follow a flight plan nearly identical to the firstFalcon 9 launch, but this time the Dragon spacecraft will separate from thesecond stage and will demonstrate operational communications, navigation,maneuvering and re-entry," Musk wrote. ThisSPACE.com graphic gives some details about Dragon and the Falcon 9. Eventually, Dragon capsules are expected to fly themselvesto the space station, where astronauts aboard the orbiting lab will use theoutpost's robotic arm to grapple the craft and attach it to a docking port. Asimilar process is used for Japanese cargo ships that visit the station. For this test flight, however, the first Dragon capsule willstay well clear of the space station, and then test its re-entry capabilitiesand parachutes for a Pacific splashdown. "Although it does not have wings like shuttle, theDragon spacecraft is controlled throughout re-entry by the onboard Dracothrusters which enable the spacecraft to touchdown at a very precise location ?ultimately within a few hundred yards of its target," Musk wrote in therecent update. Tomorrow's demonstration flight will send the capsule towardsplash down in the Pacific Ocean off the Southern California coast. But that'snot how things will always go. "While Dragon will initially make water landings, overthe long term, Dragon will be landing on land," Musk wrote. SpaceX began developing Dragon internally in 2005. InDecember 2008, NASA awarded the company a $1.6 billion dollar COTS contract tomake a minimum of 12 supply flights to the space station using Dragon and theFalcon 9. NASA also left the door open to add more missions, whichcould bring the value of the contract up to $3.1 billion, SpaceX officials havesaid. SpaceX isn't the only company NASA is counting on toresupply the space station. Orbital Sciences has a $1.9 billion deal to make eightflights using the company's Cygnuscapsule and Taurus 2 rocket, both of which are under development. The first test flight of the Taurus 2 should come in 2011,according to company officials. After that, Orbital plans to make a full demo run under itsCOTS contract, likely toward the end of 2011. During that second flight, afully operational Cygnus capsule will dock with the station, Orbital Sciencesofficials have said. "As it stands right now, we're about a year away,"Barron Beneski, vice president of corporate communications for OrbitalSciences, told SPACE.com. "We have our nose to the grindstone, workinghard to develop our system." Next year will also be a busy one for SpaceX since thecompany's Dragon capsules will still have a few more hurdles left aftertomorrow's test flight before they can begin hauling cargo to the InternationalSpace Station. In 2011, Dragon capsules and Falcon 9 rockets are expected tomake at least two more demonstration flights, according to SpaceX officials. The first 2011 demo, which is expected to last five days,includes a space station flyby, during which a Dragon capsule should approachwithin 6 miles (10 km) of the station. The next demo should last about 3 daysand will include an actual docking with the station. In his update, Musk said he applauded last month's approvalby the U.S. Congress of a new NASA authorization act that includes a largerrole for commercial spaceflight efforts to provide transportation to low-Earthorbit. "Thebill sets NASA on an exciting course to focus on exploration beyond low-Earthorbit, while recognizing the valuable role American companies are ready toundertake in ending our reliance on Russia to carry our astronauts to theInternational Space Station," Musk wrote. "Investing in commercialcrew transport will build on NASA?s proud record of innovation and will createcompetition that will force companies to improve reliability, increase safety,and reduce costs."